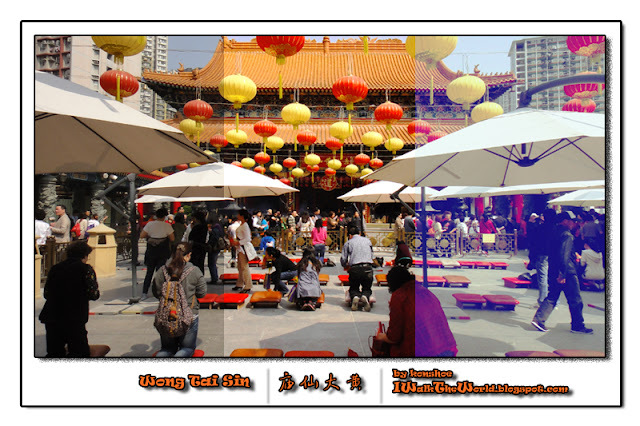 Images of the main altar were what I saw the most as I researched materials on Wong Tai Sin temple, although I had not an inkling of that. The upturned curve of a majestic roof which is familiar with most Buddhist temples of South-East Asia emulated that of the Imperial Palace, and I felt a kinship to this unfamiliar land with a recognizable slice that was parallel to the place where I originated from. 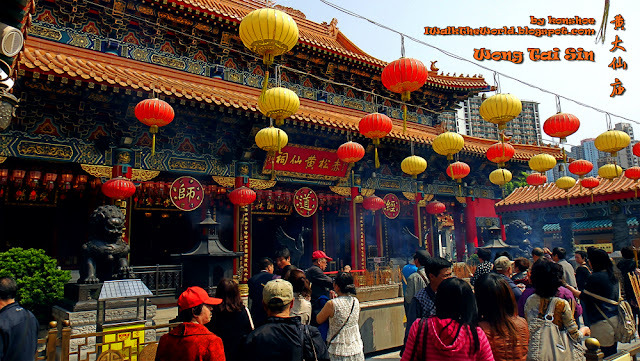 Wong Tai Sin temple is one of the major tourist attraction of Hong Kong, drawing multitudes of people from various walks of life as well as different part of the world to visit, asking for wishes to be granted. 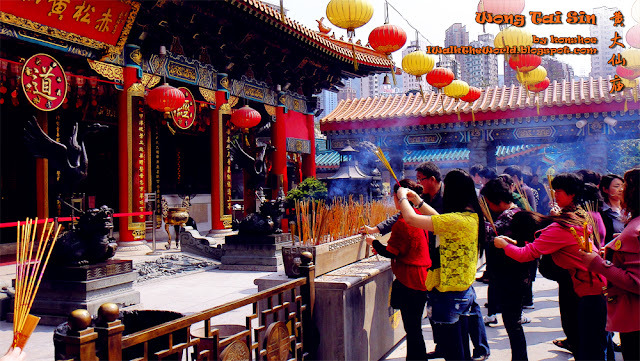 Just as Wong Tai Sin is one of the reason to travel to Hong Kong, the main altar erected for the patron of its namesake is the most crowd drawing within the whole temple complex. I was mentally prepared for the crowd but was still surprised by the throng of people during a weekday. It wasn't hard to guess that most of the crowd were not local, with most of the tour guides instructing in Mandarin to the tourists under their care on how to pray for their wish to come true. 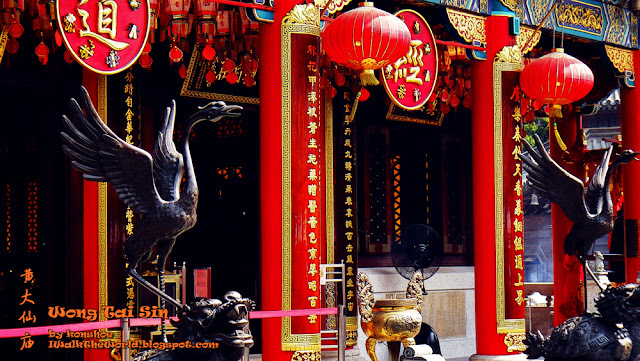 Even if you are not the religious type, Wong Tai Sin temple is worth a visit for its share of architecture as well as arts. Although I was not sure what is the real intent behind this framed herd of goats and sheep in gilded gold, I could harbor a guess that it is to portray Wong Tai Sin's earlier life as a shepherd before he achieve immortality. Familiarity with the architecture of Chinese temples of Malaysia did not mean that I appreciate less of this main altar. 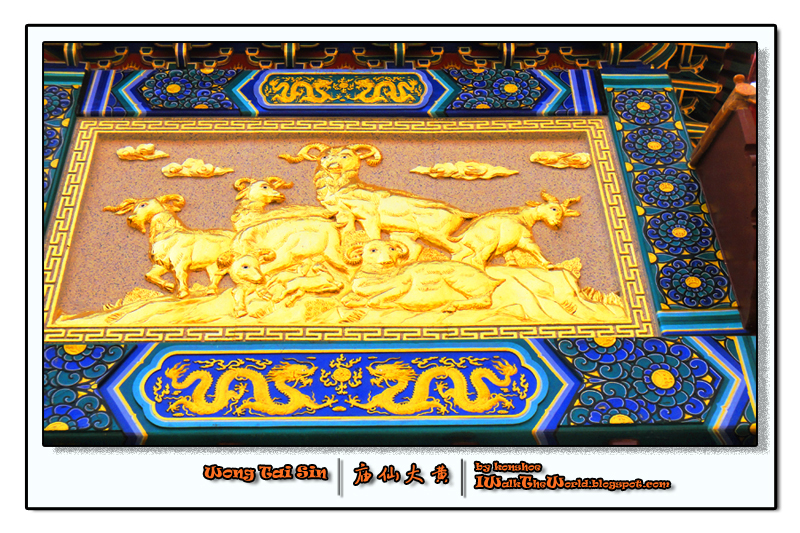 In fact, it seemed to be as meticulously decorated, if not more so, than most temples I visited. Apart from the orange majestic top that it had as a roof, the winding patterns of cerulean blue, aquatic green, fiery red and captivating golden dragons were mesmerizing. Making it more festive than religious were the rows of red and yellow oval lanterns, although the dark guardians in front of the altar left no doubt of the temple's sanctity. Various shots of the outset of the main altar. The main altar was cordoned off from visitors, and everyone were only allowed to approach as far as the incense burners were placed. 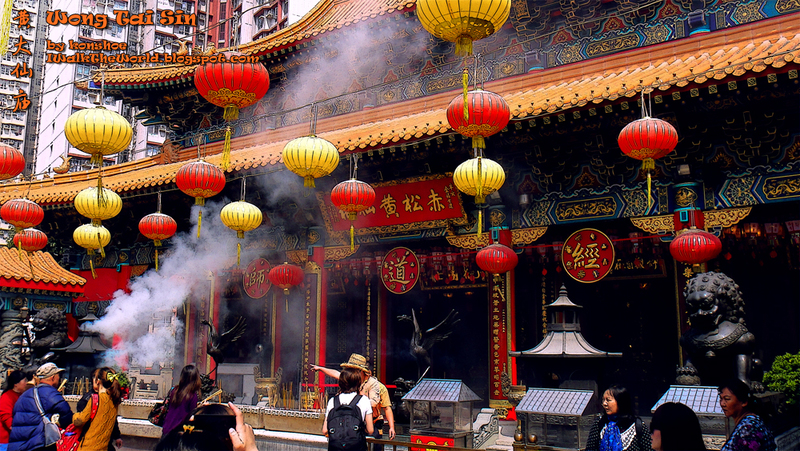 The dark interior was barely visible to me, made worse by the eye-watering wisps from burning joss sticks. No pillars nor windows were unadorned, be it with words of wisdom or geometrical pattern usually seen across most Chinese temples. 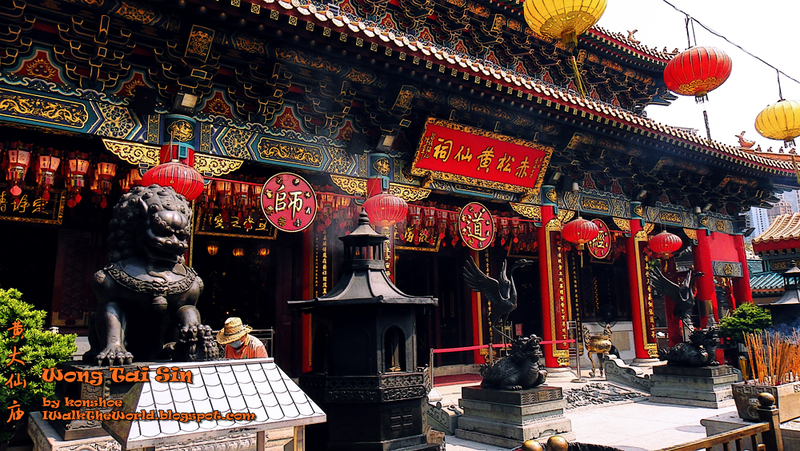 The sign over the altar's main gates was decorated with the words "赤松黄仙祠", reminding visitors of the patron deity. According to online sources, although Wong Tai Sin was a Taoist patron, the main altar was dedicated to Buddhism, Taoism and Confucianism, three of the most important teachings in China. The interior was supposed to hold paintings and artworks depicting teachings of the three religions, as well as the history of the deity. Too bad that the altar was cordoned off from the throng to preserve its sanctity from the rowdy crowds, and one could not view too far into the dimly lit interior. The image of a temple without its ardent believers and followers seems wrong, and as such I managed to capture images of praying visitors in my next article. 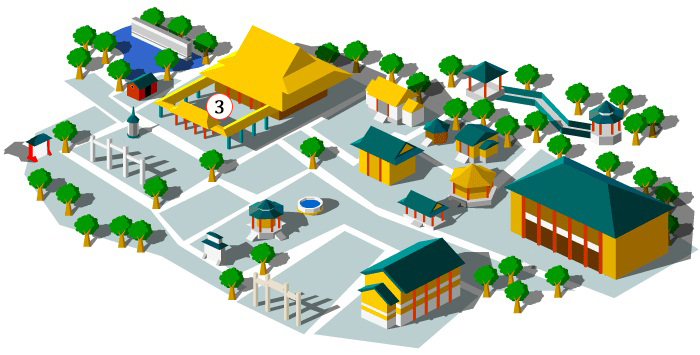 Map taken from SikSikYuen's website. The area marked #3 is the main altar.